A couple of weeks ago, a genuine wooden galleon, Andalucia, was docked at Pier 13 right here in Manila. For barely a week it was open for public viewing and bus loads of people took the rare chance to go aboard the historic vessel, through the courtesy of the NCCA. I was fortunate enough to be forced by MTLA classmates Grace Servino and Rhia Digo to brave the early morning Manila traffic and make our way to where the galleon was berthed. With that same luck, we got there on a Thursday when crowds were manageable and the lines were quite short. We got in and out in an hour's time, but not really fast, enough for us to get good pictures of the huge boat to share. Before we were allowed to go on the galleon, a brief seminar was given on how important the galleons were from the 15th to 19th centuries. There we learned that a lot of plants and vegetables were actually brought to the Philippines because of the galleon trade. Produce were brought in on board the large galleons coming from Mexico and other parts of the world thus becoming some of the early plants from the New World to get introduced to the Philippines. 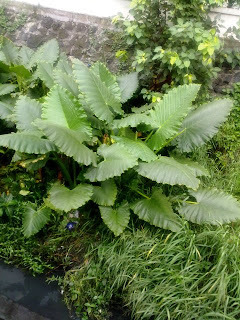 They further illustrated that all of the plants mentioned in Bahay Kubo song are all non-native plants and vegetables. They were crops popularized by the Spanish governors to be planted by Indios in their respective backyards. Seeing the Andalucia, you could recognize that it is not a big boat. But upon embarking on the deck, I still got amazed on how pre-high technology could have built such a vessel out of wood and made them travel the seas and navigate around the globe. Again I remembered the story I heard that the Spaniards over-harvested our forests for different woods to build these magnificent galleons. I still have to confirm that one of their wood choice was our endemic Tectona philippinensis or Philippine teak. I began to wonder if any part of the Andalucia was built using Philippine wood. As we descended to the lower parts I got to realize that the Andalucia had real life cannons on board. They peek through small windows where the crew probably peeped through to aim at the enemy. I again began imagining, this time the battles that the old galleons must have encountered through history. I was envisioning the cannons being aimed at a coconut-lined beach while the natives were charging the galleons on board their small rigged bancas. Hehehe, I admit I have a very strong imagination. But seriously boarding the Andalucia is such a historical experience, painting a very clear picture of what it must have felt like to sail the seven seas early on in history. The Andalucia was only staying for a couple of days more in Manila before it gets to sail to Cebu for another week, then it's off again on a voyage to another part of the world. I am not sure if this galleon would again set sail for Philippine shores. I am glad it docked in Manila and happy I did get out of bed that morning to get on it, even if it was only for a few minutes or so. For the price of a cab ride to Pier 13 I got to experience time travel and 'Ship ahoy!' on board the Andalucia. Ever since I was a teenager I was always fascinated by the World Fair. In high school my favorite past time was looking through the pages of international magazines researching on expositions in the school library. Probably explains why I took architecture in college and why I made a thesis on World Expos in my undergrad. 20 or so years after I find myself walking through the grounds of one, the Shanghai 2010 World Exposition. It was a very gruelling experience to queue in line, walk all day and traverse the whole expanse. But the 2-day trouble was worth every pain and penny. I've had sored calves and heels which lasted a few hours but I've gained memories which will last me a lifetime. One thing which made the trip much more rewarding was seeing our very own Philippine Pavilion. The simple structure designed by Lor Calma is all white interrupted only by different images of clapping and performing hands. In fact the theme of our pavilion was aptly named 'Performing Cities' and highlights the different festivals and arts of the country. The Philippine pavilion is certainly not the most impressive display in the EXPO, but it could probably be one of the most lively. The plan is composed mainly by a number of performing stages. At one time a performance may be on going on one of the stages, and right after it finishes, another show will promptly start at another making the partying crowd transfer from one corner of the pavilion to the other. Dancing through the Philippine exhibits surely beats waiting while queueing in line just to enter the more popular pavilions. I just stumbled upon this waterway and at first glance identified 5 native species. 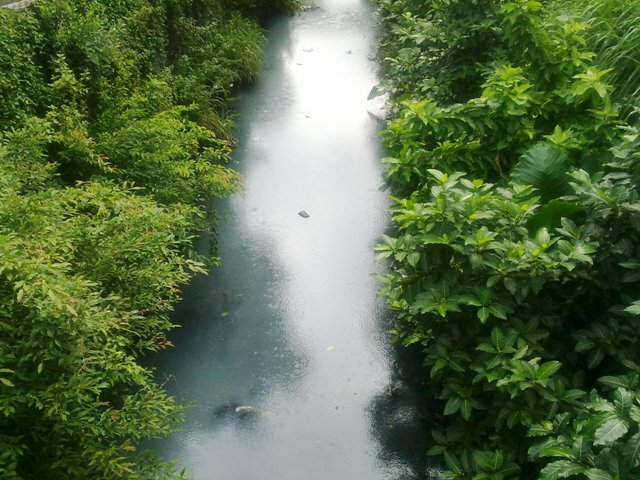 It is refreshing to see such covered with lush greens. This 'stream' looks so serene and calm, you would think it is tucked hidden in the deepest forest or the highest mountain. It is not. 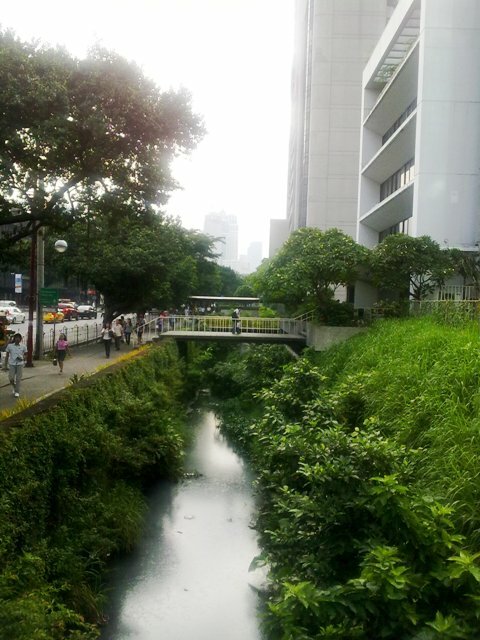 It is located at the very heart of Makati, on Buendia Avenue, where all the busy traffic is. And the 'stream' is not a stream but rather a ditch, a deep drainage canal. Is this hostile environment the perfect conditions for some natives to thrive. 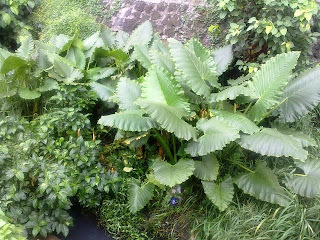 Some native species, like dalakit (Ficus concinna), hawili (Ficus septica), is-is (Ficus ulmifolia), biga (Alocasia macrorrhizos) and gabing uwak (Monochoria vaginalis) are just plain resilient and could grow in the most surprising places. So it is not impossible to establish natie species in the bustling metro. Sorry for the blurred pictures. 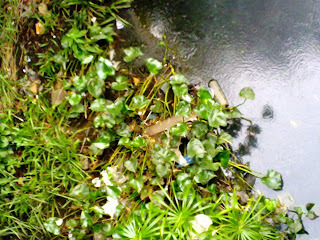 They are from my fone cam. I just watched Prof. Winnie Monsod's last semestral lecture video on YouTube link. . I was touched by her sentiments. I am amazed by the coincidence because just weeks back I was having a small talk with a true blue Atenista, Mr. Ed David, about how much it takes to educate college students in the leading Philippine universities. And he mentioned the same problem of how our prime medical graduates from the U.P. College of Medicine would receive the best of the best education but about 80 percent would end up working abroad. Mr. David did not elaborate on the whole subject but he somehow gave me an idea on how a U.P. should be thankful for his education. I am not the best person to actually paint such cost scenarios but I think my illustration would be easy to comprehend for a lay person. It is basic knowledge that an average Atenean would pay something around P60K for a semester of quality education in Ateneo. A La Sallista would pay something in the same vicinity for a trimester load. A UST student will pay P40K plus per semester. Which means that these schools will have to shell out that kind of a budget per student for his/her education, so in Ateneo, a student is budgeted P60k multiplied by 2 semesters equalling to 120 thousand in a year. A UST student at 40 K x2 is 80K or so budget for the year, budget meaning the cost they allot to pay the salaries of competent (qualified) teachers and administrative staff, facilities maintenance, electricity, library books, water, etc. But what about students in the premier state university? If we are to compute what a single U.P. students pays in a year, it is as low as 30 thousand for a semester which amounts to 60 K in a year, a far cry even from UST's 80 thousand plus budget per student.- not much of a budget to uphold the honor and excellence which U.P. is striving for. So how in the world would an institution of excellence like U.P. pay for the good quality it promises each and every one of its students? When I was in college I was included in the first batch to be immersed in STFAP bracket 9. But even paying the full tuition (in 1989 was 4 thousand per sem), we were told that we still could be considered scholars as the price of educating us would be much more than the 4 thousand we were shelling out. Of course being students and knowing that the previous batches paid almost nothing in U.P., much of my contemporaries were outraged by the sudden escalation of tuition fees. I myself just wondered how much more U.P. was covering for me. 20 years after I got to learn how much it costs. I was told that U.P. student is budgeted around 180k per year, much more than 120 K per Ateneo stude. If that is the case, then each U.P. scholar is subsidized by more than 100k. Could that be true? But if we equate that U.P. is one school which provides housing for its faculty and staff, just for them to remain teaching in U.P. Double premium on PHD professors so that they would stay teaching with a meager salary, to uphold the quality education in each of the colleges. U.P. does not only strive to excel as an collective institution. Each and every college would want to be the very best in its particular field. Which means providing facilities for students entering almost all endeavors, even if it means that there is only two or three students in every classroom. U.P. needs several buildings to house all of those colleges and courses. For an architect like me, I would understand that each building would require a bundle to operate and maintain, just to provide a place for honor and excellence. Learning about this actually gives Professor Monsod a reason to be sentimental about U.P medicine graduates going abroad. Imagine Filipinos paying 180 K x 7 years for an INTARMED student. Then they go out fly to another country and serve there. Even foreign scholarship grants have in mind the importance of returning to and serving in a student's country of origin, requiring the scholar to render years of service in exchange for the free education. Of course there is nothing wrong about aspiring for a better life and grabbing better opportunities which our country could not provide. But as U.P. studes, partaking on the generous education subsidy, we enter the honor and excellence clause and promise to uphold the ideals of the university. UP develops analytical minds. To us UP grads, a little service to our country sounds logical, we need not even count the years and the pesos spent on us to gain quality education, honor and excellence - or else Prof. Monsod will haunt us from her future grave. But joking aside we need more idealistic people like Prof. Monsod, may she live for many more years to come. May she influence more people from our ranks, UP students and UP graduates, aspiring to become the future leaders and hopefully the fine rays of hope for our country.